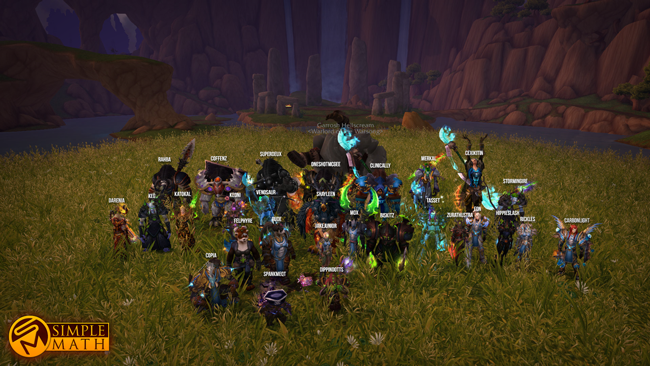 Another expansion completed and another force forever reckoned with by our teamwork and determination! We eagerly await for what Blizzard has in store for us with Legion. We welcome everyone to join us in our fight against the green armies preparing to invade! If you think you got what it takes to join our side, then head over yonder and submit an application today! They call us Simple Math, "For We Are Many." two years pass and you guys still can't take good screenshots without me. i could add myself to every one of them. nvrm forgot it's "fixed that for you"
We should've used the SELFIE cam for this.